The Al Thani family is a branch of the Maadhid tribe, who originally lived in the Jabrin oasis in southern Nejd and claim descent from the Bani Tamim tribe of central Arabia. In the 18th century they moved to the south of Qatar, then to Zubara, and then, in the early 19th century, to Fuwairit. After the defeat of Bin Tarif they took advantage of the power vacuum left by his death, and under the leadership of Sheikh Mohammad bin Thani they moved from Fuwairit to Doha, sometime between 1848 and 1850. Hostilities between the Al Khalifa of Bahrain and Faisal bin Turki, the Emir of the Second Saudi State, gave Mohammed bin Thani the opportunity to play the two powers off against each other. First he declared for Faisal and took control of Doha’s main water supply by seizing its guard tower (the Burj al-Mai). Later a peace agreement was reached and the town (presumably including both Bidda and Doha) was returned to Al Khalifa over lordship, with Mohammed bin Thani remaining as its sheikh. Relations broke down again in 1852, leading to a Bahraini blockade of Doha, but a further peace agreement restored the status quo. Captain C.G. Constable and Lieutenant A.W. 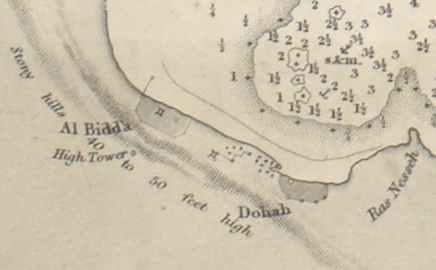 Stiffe drew the first detailed map of Bidda and Doha in 1860, which showed two walled towns of approximately the same size, Bidda in the northwest with a square fort and Doha in the southeast with a round tower at its western side. In between is a square fort which can be identified as a new fortification built by the Musallam tribe around 1850 with the support of the rulers of Bahrain, who wished to impose firmer control of Bidda and Doha. This later became the Turkish Fort (Qal’at Al-Askar), which after 1915 became the site of the Amiri Diwan, the home of the Al Thani rulers of Qatar. Between Doha and Bidda there is a spread of housing, identified as Little Doha (Dohat al-Saghira, later Dowaihat), also said to have been founded by the Musallam, and considered a third town by Constable and Stiffe. This later became fully part of Doha and included the areas of Jasra and Suq Waqif. This spread of settlement in the mid 19th century marks the beginning of the growing together of Bidda and Doha into a single town. Doheh [Doha] is a town partly walled round, with several towers, half a mile S.W. by W. from Ras Nesseh; it extends about 800 yards along the beach. The sheikh’s house is at a large round tower (with the flagstaff) on the beach, about the centre of the town; to the west of this tower is a small bight, where boats are hauled up to repair… Between this town and Al Bidda, and almost connected with Doheh, is a distinct town, recently built, called Doheh Saghireh (Little Doha), which has a new square fort at the south-west corner, built on the rising ground at the back of the town… Al Bidda – there is only 400 yards of open space between this town and Little Doheh; the three towns together extend one mile along the coast. Bidda is built up the side of the rising ground; there is a fort in the town, where the Sheikh’s flag is shown, and two towers on the highest part of the land behind the town, one of which is the first thing seen from the sea. One mile and a half to south-eastwards of the town is a tower near the wells, with a little cultivation; with this exception the whole country is desert. The Persian Gulf Pilot, First Edition, 1879. Archive Editions. The town of Bedaa’ [meaning Doha] itself was soon explored. It owns a long narrow and dirty market-place, where some Bahreyn shopkeepers and artisans ply their business on a small scale; for the rest, Bedaa’ consists of a mass of little narrow dingy houses, separated by irregular lanes. The total amount of its inhabitants when on land, which is not often the case, reaches about six thousand; a few colonists from Hasa come hither to try their fortune and grumble at the country… If we go down to the beach, we find there line on line of huge black boats, whose grooved edges show where the divers’ cords have been let down, for a rope is always tied round the waist of the plunger, while the other end is held by his companions, and by this they draw him up when required. My first visit was to Dowhah [i.e. Bidda], a village to the north of Bedaa’ [Doha], and of about half its size; it is situated, as its name of “inlet” or “creek” imports, in a small deep bay, where the cliffs behind, sixty or eighty feet high, give it a somewhat picturesque appearance. But the houses of Dowhah are even lower and meaner than at Bedaa’, and the market-place is narrower and dirtier. Two castles overtop the place: one stands on the neighbouring cliff, the other within the town itself: the chief is a small sub-collector to Ebn-Thanee. Frustrated by the growing power of Mohammed Bin Thani and their corresponding loss of control of the Qatar Peninsula, the ruler of Bahrain launched a devastating attack on Doha and Wakra in alliance with the ruler of Abu Dhabi, Sheikh Zayed bin Khalifa Al-Nahyan. Both towns were said to have been temporarily “blotted out of existence”. This angered the British, who deposed the ruler of Bahrain (Mohammed bin Khalifa Al-Khalifa) and forced heavy reparations out of Bahrain and Abu Dhabi. It only strengthened Mohammed Bin Thani’s position in the long run. Following the British intervention in Bahrain, Mohammed bin Thani signed an agreement with the British not to join forces with his erstwhile enemy Mohammed bin Khalifa, the deposed former ruler of Bahrain. In this agreement he was referred to as “Mahomed bin Sanee, of Guttar”, perhaps implying some kind of primacy over the other sheikhs and tribes of Qatar. A later British official (Prideaux) observed in 1909 that this agreement marked British recognition of Bin Thani’s independence from Bahrain.